There is something galvanizing about the intense rush to utilize leftovers. It's a race against time and the consequences are life or death. It's like that movie where Jason Statham has to keep using up Thanksgiving leftovers or else his heart with explode and then he fights some guys in an oil slick while wearing bike pedals on his feet. What can I say? I've always been an adrenaline junkie. 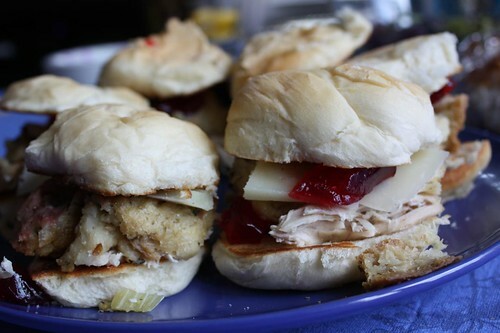 Sunday afternoon I used up some of Jen's popular rolls and made these turkey sliders. The rolls were the biggest hit of Thanksgiving this year. I had a great idea to hook up my ipod in the bathroom and play Thelonious Monk albums on shuffle so people could mellow out to some his 50's and 60's jazz stylings. Surprisingly, that was the second biggest hit of this year's Canadian Thanksgiving. Go figure. 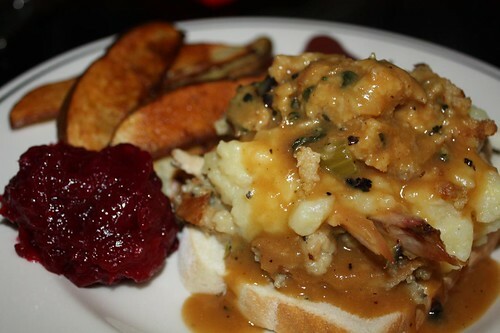 I filled the rolls with turkey, gravy, stuffing, cranberry sauce, and a slices of Manchego. They were divine. 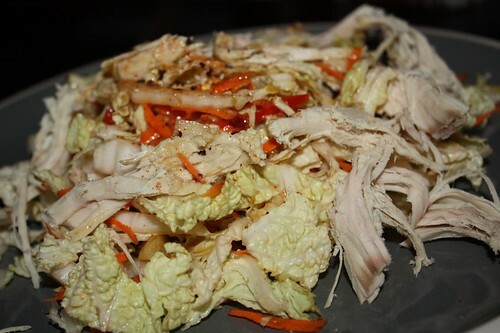 By Monday night we were ready for something a little lighter so we made Jen's turkey chinois salad. This consists of nappa cabbage, shredded carrot, scallion, chopped almonds, and julienned mini bell peppers that Jen picked up last week at the farmer's market with the express purpose of putting in a horn of plenty then forgot. Jen loves few things in this world more than a horn of plenty. 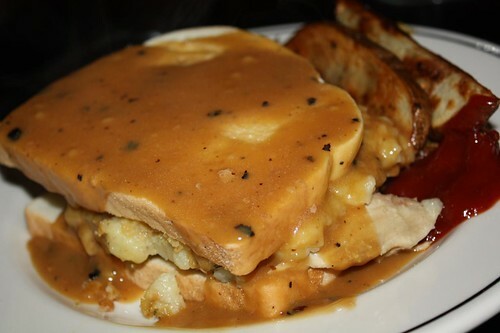 On Tuesday we made a triumphant return to unhealthy foods with hot turkey sandwiches. Jen and I have an annual open-faced/closed sandwich duel. The winner? Everyone! By Wednesday we were fortunate enough to be able to convince some friends to come over and give us a hand. I think this is the first time we were ever able to do this successfully. 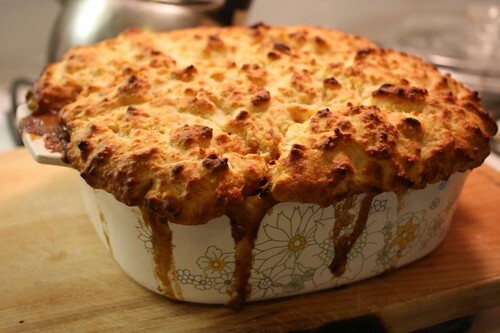 I made turkey pot pie with the leftover turkey, gravy, and roasted vegetables (shallots, rutabaga, turnip, carrot, butternut, and sweet potato). Wednesday I thickened up the creamy polenta leftover and cooled them so that on Thursday I could grill it. 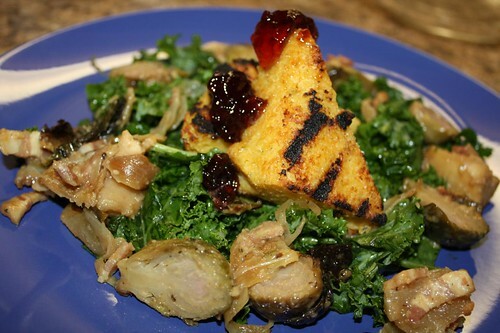 I tossed some kale in lemon and olive oil and served this over the top. With the remaining brussel sprouts I made a mustard and apple cider vinaigrette with the remaining bacon, onion, and apple and tossed it all together. I topped the polenta with cherry habanero jelly that Jen had brought home with her form Cherry Country on her recent trip to Portland. By Thursday I had frozen everything that I could in hopes for some future use. This usually means waiting for several months then throwing it all away. Hopefully I'll be more diligent this year. 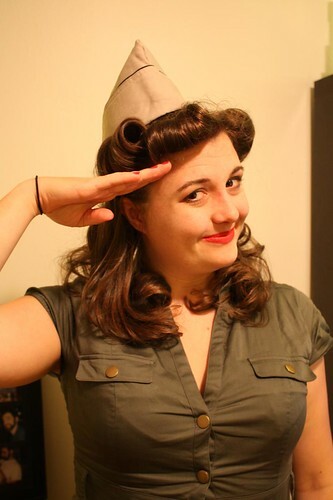 Last night I came home to Jen who was in full Halloween attire as a 40's military woman and ready to go to the Halloween party we were to attend. She'd been ready for some time as I was three hours late returning to work after 95 was shut down to capture some really bad carjackers. This is my second favorite shutting-down-95 story trailing after the time this summer when I was two hours late to work because a man claiming to be Jesus Christ was running naked across all lanes. Ah, the adventures of route 95 in Connecticut. The result was, sadly, not going to the party. It was also me being famished after not eating for 8 hours. 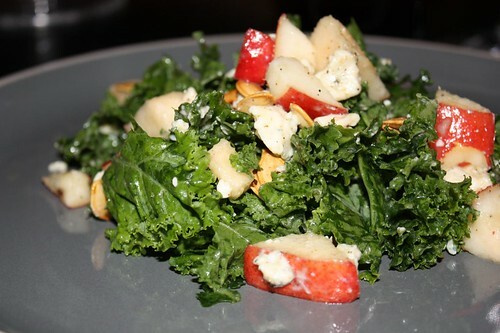 As we wound down on our leftovers all I could really put together was this salad with kale, Danish blue cheese, toasted pumpkin seeds, sliced red pears, cider vinegar, olive oil, salt, and pepper. After a commute like that and an unfortunate cancellation of plans the only remedy is to drink some wine. 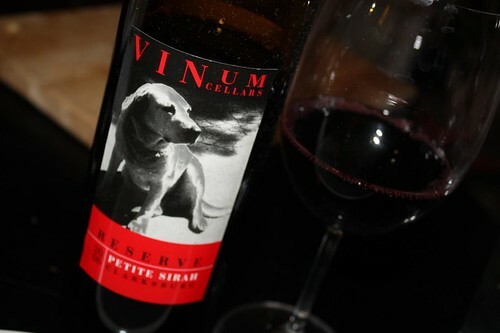 And what better wine to have than this petite sirah from Vinum Cellars? This is definitely my favorite wine that features a photograph of a dog on the label. Since we missed out on the Halloween party we made up for it by wrapping up the last couple of episodes of True Blood that we hadn't seen. Oh, and then we did the Monster Mash. Süper görünüyor. İştah açıcı ve çok leziz, ellerinize,emeğinize sağlık. That is a wonderful picture and a very inventive costume Jen. More correctly, "That is a wonderful picture of you in your Halloween get up Jen, and very inventive"